The World Economic Forum (WEF) is one of the most influential elite organizations, alongside the Council on Foreign Relations, the Bilderberg group, and the Trilateral Commision. Every year, the forum brings together some 2500 top business leaders, international political leaders, economists, celebrities and journalists to discuss world issues. Vigilent Citizen report: In many ways, the WEF is similar to the Bilderberg Group. Interesting fact: Klaus Schwab, the Founder and Executive Chairman of the WEF is a former member of the steering committee of the Bilderberg Group. Not unlike other powerful organizations that claim to “help the world”, the WEF is accused of actually promoting the interests of the world elite. Far from actually solving world problems, the WEF is accused of simply shifting the blame from governments and major conglomerates to regular citizens. 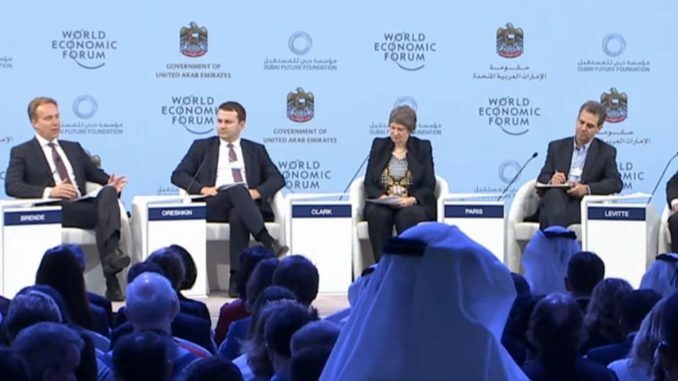 The WEF’s Annual Meeting of the Global Future Councils took place on November 11-12 in the United Arab Emirates. One of the topics discussed was “mind control using sound waves”. The WEF’s official website published an article entitled Mind control using sound waves? We ask a scientist how it works where University of Oxford Professor Antoine Jérusalem describes the technology and the issues related to it. Controlling the brain with sound waves: how does it work? What social good can come of it? The current buzzwords are Alzheimer’s and Parkinson’s disease, as well as traumatic brain injuries. But scientists are also looking at the spinal cord and peripheral nervous systems. As far as I am concerned, since the brain is the de facto centre of decision for so many processes, any of them could be targeted. When attempting to ‘control’ neuronal activity by providing minute mechanical vibrations to a region of the brain, it’s important that the focus of the ultrasound, frequency and amplitude are properly tuned, or the brain can potentially be damaged. The point is that we still don’t know how to tune all of this; and if I were to exaggerate a bit, I could say that our current approach is not that far off from fiddling around with the settings on a radio until we hear the right station. One of the many difficulties is to know for sure that we are indeed controlling neurons with these sound waves, as opposed to damaging them. The truth is that we still don’t know how the process works. And if you don’t know how it works, you don’t know how much is “too much”. What are the biggest ethical challenges? The potential of this technique is huge – by that I mean the sheer number of applications, as well as the ethical use. I am also convinced that human nature is such that if something can be done, it will be done. The question is by whom. I would rather have a fair society leading the dance than some rogue state without any respect for human or animal life. If we want to lead that dance 10 years from now, we need to start researching today. How dystopian could it get? I can see the day coming where a scientist will be able to control what a person sees in their mind’s eye, by sending the right waves to the right place in their brain. My guess is that most objections will be similar to those we hear today about subliminal messages in advertisements, only much more vehement. This technology is not without its risks of misuse. It could be a revolutionary healthcare technology for the sick, or a perfect controlling tool with which the ruthless control the weak. This time though, the control would be literal. What can we do to safeguard its potential? I am not going to argue that scientists are all wise and knowledgeable when it comes to what should and should not be done. Some of us will go as far as we can get away with. But that’s human nature, and not unique to scientists. Either way, our job is to find something that is beneficial to humanity. And if you find a way to make somebody better, then you most likely also know how to do the contrary. The goal is to make sure that regulation prevents the latter, without impeding the former. I believe that this is the role of regulators. And I think that the European Union, where I work, is quite good at this. Another role of politicians should be to provide a communication platform to explain the long vision of any given area of research. And it can be too early, or not a good idea, and the final decision might very well be to stop it. But in the long term, the public should have the potential benefits of a new technology explained to them in plain words, which is something that scientists are not necessarily good at. Politicians should remember that if we don’t do it, then somebody somewhere will do it anyway…potentially unregulated. In short, Antoine Jérusalem says that remote mind control is an incredibly powerful technology that has the power to possibly cure illnesses. However, in the wrong hands, the technology can completely take control of one’s brain. In his words, it can be the “perfect controlling tool with which the ruthless control the weak”. That being said, remote mind control is nothing new and the elite had access to this kind of technology for years. A few months ago, I published an article about a leaked 1996 document describing remote mind control. Despite the technology’s admitted dystopian potential, Antoine Jérusalem believes that humanity cannot avoid developing it. He probably says that because a company developing this technology is part of the WEF. His solution to make sure that the technology is not used to turn humans into mind control slaves? Government regulation. In short, the WEF states that this technology should be under the control of the global elite. Does that comfort you?